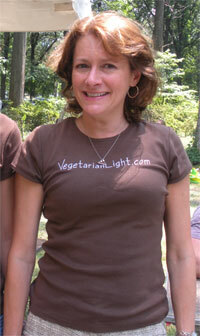 Vegetarian Light is a new website designed to embrace the healthy vegetarian lifestyle. Vegetarian Light is not just a way to eat.....it’s a way of life. The focus is good health achieved in harmony with the environment, animals, and the world around us. In March 2009, I started the website www.DailyVegetarianRecipes.com because I love to cook and wanted to share some great recipes. During the summer of 2009, my doctor told me I had very high cholesterol, and I needed to take medicine. I negotiated time to try to bring the cholesterol levels under control naturally and embarked on a low-fat, healthy foods diet and increased my cardio exercise. I'm happy to report that by eating a low-fat, vegetarian (delicious) diet and exercising more, I was able to lower my cholesterol naturally, without drugs! In June, 2010, I began VegetarianLight.com because I want to share my enthusiasm for eating and living lighter, healthier, better. I hope you will enjoy trying out some of the recipes on the site. My mom was raised on a farm in southwest Virginia. I grew up on the Southern soul food she cooked for our family. As an adult though, I have branched out into other styles of cuisine. So the recipes here range from the exotic to the "crunchy granola" to the kind-of recipe you might find in a country church cookbook. International whole food fare with a Southern heart and a hippy soul. All of the recipes share a focus on healthful, low-fat ingredients. Some may have started out full of fat, sugar or salt (or meat), but I altered them to make them lighter. And all are vegetarian. Whether you are trying to lower your cholesterol or sugar, lose weight, or just trying to eat and feel better, I hope you will find something of interest here. In addition to recipes, Vegetarian Light seeks to share tips and insight for living better and improving ourselves and our world. I hope you will check out Vegetarian Light and be inspired. Light feels right. Please share any insight, tips or recipes to VegetarianLight@gmail.com.